Find universal remote codes for your device. GE universal remote controls can operate audio and video devices of almost any brand. For each of your audio/video devices, you have to enter a Device specific GE Universal Remote Codes in the universal remote control. Programming your GE universal remote will allow you to use the remote with different devices, including your blu-ray, television, DVD player, VCR, stereo systems. Have you ever had to juggle with multiple remotes to control your TV , Blu-Ray and Home theater, missing remotes and hours wasted searching each remote. Now with GE Universal Remote you can control all your home theater devices, we have a quick and simple auto-code Search method and manual code entry method. Programming universal remote is error prone and takes time so, set aside some time before you begin. Make sure to hookup and power on all the devices you want to setup. next make sure the batteries are working in the GE universal remotes. Note down the GE universal remote codes from the list provided. Nothing is more frustrating to find out that you have not hooked up or universal remote batteries are bad after spending your evening on programming GE remote. Flip your remote, Open battery cover remote batteries, you will see a sticker showing the Mode and code list version. There are three code list versions, one CL3 , second CL4 and third CL5. we have listed complete GE universal remote code list Goto GE remote Codes based on the code list version, saving you lot of hassle navigating and selecting options on multiple pages. 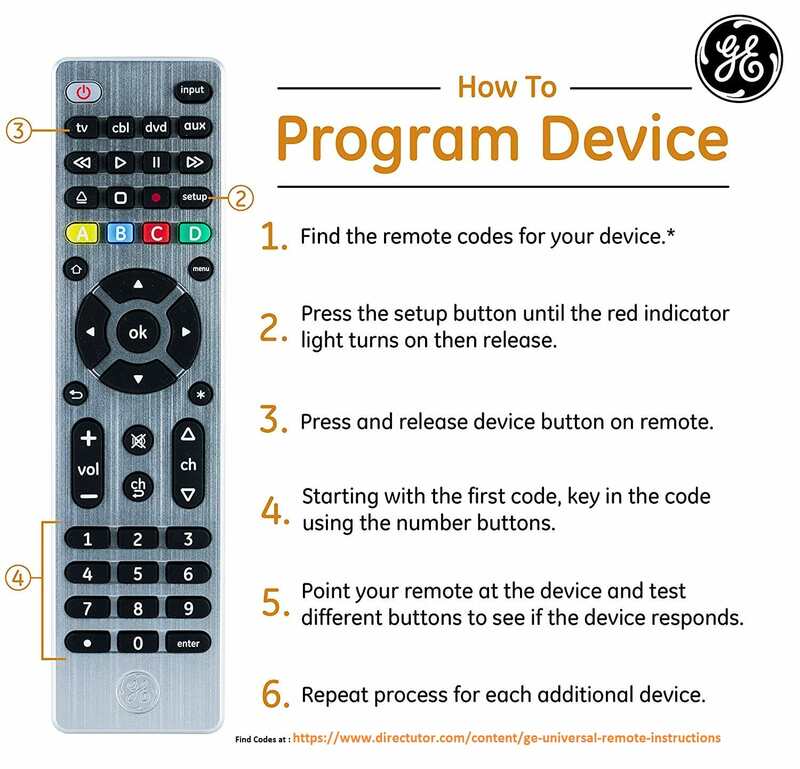 How to Program a GE Universal Remote Control. Use the number buttons on the remote to enter the first code shown here. The red light will turn off after entering the fourth digit. Note: Where codes are shown like this [code], each one can be used if you have 2 or more of the same device. Note: Where codes are shown like this: [code] it means that each one can be used if you have two or more of the same device. Note: Where the code is listed as [code1 code2] the first code is for the TV and the second for the VCR. Otherwise one code operates both the TV and the VCR. DAEWOO [0039 0252] means that code 0039 is for the TV section and 0252 is for the VCR. Note: Where the code is listed as [code1 code2], the first is for the TV and the second is for the DVD. Otherwise, one code operates both the TV and the DVD. Note: Where the code is listed as [code1 code2], the first is for the TV and the second is for the VCR or DVD. Otherwise one code operates both the TV and the VCR/DVD. Note: Where the code is listed as [code1 code2], the first is for the DVD and the second is for the VCR. Otherwise just one code operates both the DVD and the VCR. Note: Where codes are shown in brackets like this [code], each one can be used if you have 2 or more of the same device. Some GE Universal remotes support Auto-Code Search methods, if you have one of the newer GE Universal remotes these steps are for you. if you have a CODE SEARCH button on your remote you can use below steps. quick code search method does not require you to enter remote codes and save a lot of time. 1.Turn on the device you wish to program. 5.INDICATOR LIGHT will go off. When your device turns off press the ENTER/SAVE button. The SLEEP FEATURE (RM94902, RM94904 and RM94905) This feature will turn off your TV at the time you choose from 1-99 minutes.